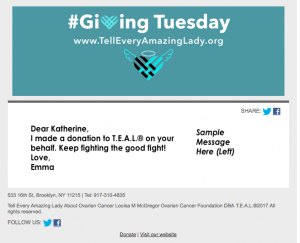 Hello, I am Madison my aunt Louisa was diagnosed 5 years ago with Ovarian Cancer but when we volunteers shouted out T.E.A.L. it became a big thing to people all around the world now every September we do a walk for all people who survived been diagnosed with it even just someone that you know and we show every body that we can make change just by doing this walk I Madison Bellocchio think that i can do any thing just by walking for my aunt Louisa McGregor and ill never forget about her!Thank you for reading this! Hi my name is Noraima I’m only 22 years old, and i represent the Teal Monkeys thats lead by Wanda Aponte. She is a survivor of Ovarian Cancer but I also walk in memory of my grandmother that passed away last year of Ovarian Cancer. I would like to help and get the word out about Ovarian Cancer. In 2008 my dear sister in law Angie was diagnosed with stage 4 Ovarian Cancer. She battled for 2 years, chemo cycles and treatments. Never once did she complain, she was determined to beat this disease. In 2010 our lovely beautiful Angie at the age of 45 was taken from our family.Our family has been involved with organizations like T.E.A.L and it will always be one of missions in life to Tell Every Amazing Lady we meet about Ovarian Cancer. We will find a CURE!